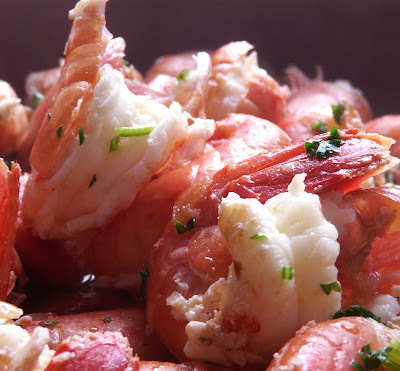 I love, love, love local spotted prawns. The season is very short, between 6 and 8 weeks. 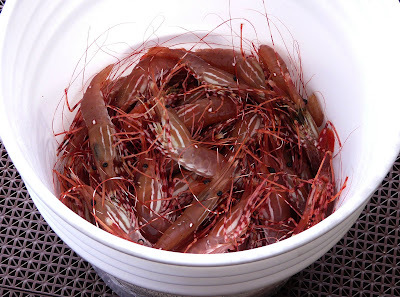 I drove down to the dock in Cowichan Bay today and picked up 10 pounds of prawns right off the boat. Half for us and the other half for our neighbour Clif. I took a big pail with me. Good thing it was deep because the little darlings were still a live and jumping all over the place. Once I got them home I removed their heads and then froze some and the rest I cooked for dinner. 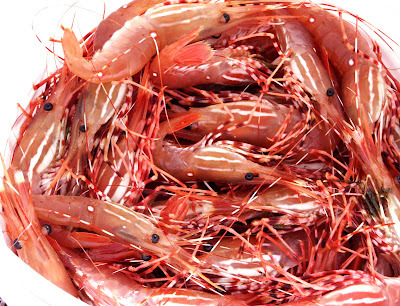 TIP: The best way to freeze fresh shrimp or prawns is in water. Lightly salted. 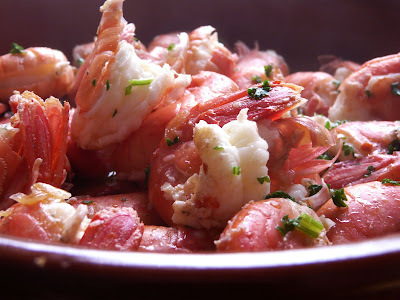 For dinner we had Garlic Prawns - a Spanish Tapa. This is a favourite recipe that I have been making for over 25 years. Good thing I baked bread today. We used it to sop up all the wonderful sauce. Heat the oil, garlic and red pepper flakes in a large, shallow pan. When the garlic just begins to turn golden, add the shrimp and cook over high heat for about 3 minutes, stirring constantly. Add the broth and lemon juice. If serving in the living room, pour into a large earthenware bowl and sprinkle with salt and parsley. Serve immediately. Note: Use more chicken broth and lemon juice if you like lots of sauce to dip the bread into. Ann, as you know, this is one of my favorite recipes of yours. I've never had fresh spotted prawns. I'd love to taste them some time! I've never had a prawn, but they look good. I make something similar with other seafood, and you're absolutely right, you must have bread to sop up all that wonderful juice! I would certainly like to try a prawn. They look very good. Us too..one of our faves of yours! I would be so happy with that dinner Ann ~ I cannot tell you how much. Beautifully captured in images, too. I hope one day I will get to taste one of those spotted prawns! Those look PERFECTLY DIVINE... I would like to eat them with the bread in your last post... and a glass of champagne please! Ann, we also enjoy these, and have used this recipe many, many times. I used the wonderful chicken roaster that you sent me in a swap, and posted it on my blog tonight. Thanks again! !